Download them here and cherish the past times at Camp Mowglis. 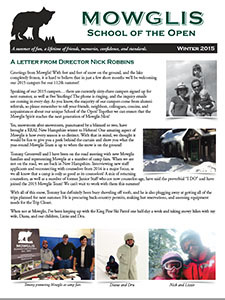 The Mowglis Call is an annual publication mailed each fall. To receive a copy of The Mowglis Call by mail, contact us online. You may also view more recent issues online by downloading them here. The Mowglis Howl is the camp’s annual yearbook. We are in the process of scanning each year, and will update this list as the books are completed. Please check back regularly to view years as they are added. Mowglis closed for the summers of 1943 and 1944 during World War II. The camp did not resume publishing Howls until 1957. if you have photos from the late ’40s through ’57, would you share them with us so we can post photos of those years? To view the Mowglis Songbook, download it here. Click on Chapel Book to view our newly updated version. Click here to view the catalog, which includes a summary of the exhibit, along with photos and a history of summer camps in New Hampshire.